When summer comes along, everyone enjoys eating outdoors. The problem is the uninvited guests. No, I don't mean that goofy neighbor across the street or those relatives that seem to be able to smell a freshly-grilled steak from across town. I mean the wasps that want to nibble your steak, the fruit flies that flock to the melon slices, and the houseflies that don't discriminate. Between those pests and the problem of keeping cool foods cool, is it really worth setting up that table outdoors? 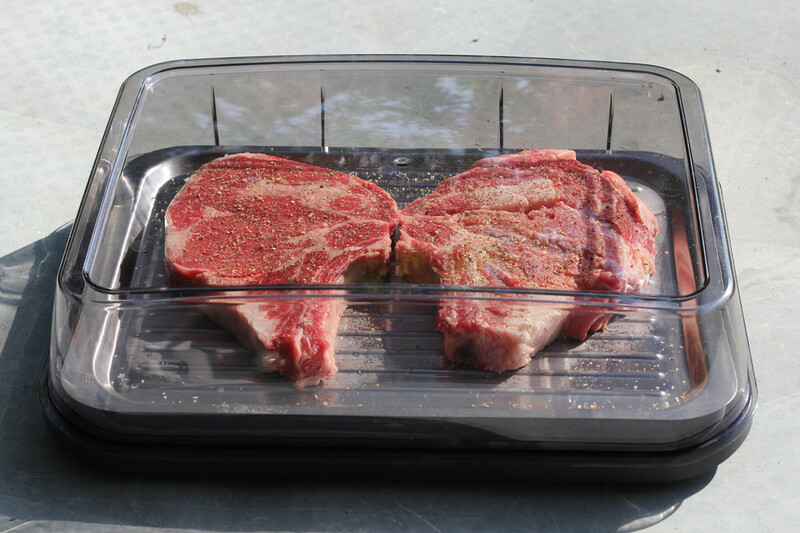 The Vacu Vin Cool Plate is designed to make outdoor cooking and serving a whole lot easier. Those steaks are big. You could easily fit four strip steaks. It's a pretty simple device - lidded box with a metal tray that sits above a section where you put a reusable freezer pack. The freezer pack is designed to fit perfectly into the tray, and to make it easier to stuff into your freezer, it folds in half. One thing I really like about the box is that the lid lifts off easily, but if you lift it open rather than lifting it off, it stays in place in the upright position. That means you can take things out of it without having to hold the lid open. And since you don't need to take the lid entirely off, you don't have to find a place to set the lid down. The Cool Plate has a lot of uses. 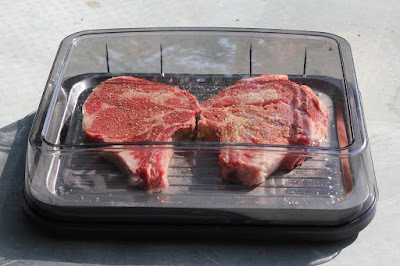 For one thing, you can put food in it before you cook it, and the cooling plate will keep it from precooking from the blazing sun while also keeping flying critters away. When the food is cooked, you can use it to keep the food safe and warm. Just remove the rack and wash it - or just remove it - and take out the cooling pack. You can also use it for keeping foods cool for serving - like those melon slices, cupcakes, or burger toppings and condiments. This certainly isn't an ice chest or a freezer - it's meant to keep foods cooler than if you left them out in the open. But if you leave this sitting in the sun for a couple hours, it's not going to keep your potato salad completely safe. If you need to keep things cool for a longer serving time, you could refill the bottom area with ice from your cooler or other freezer packs. And of course, try to keep foods in the shade rather than in direct sun. While the Cool Plate isn't the most attractive thing ever, it's also not ugly. It's marketed to be used outdoors, but you could also use it indoors to hold foods that you want to keep cool but easily accessible during a party, like deviled eggs, cold cuts, or lox for your bagels. If coolness isn't an issue, it's still a nice serving container with that lid that lifts and stays in place. Who's it for: People who want to keep foods cool indoors or out. Pros: It's a low-tech device. I liked the size - big enough to hold enough, but not super-bulky. Cons: This is going to be one more thing to store. Wishes: Some folks might want a variety of sizes for different purposes.